For those who wish to gain new experiences and master their skills! No age limit. This “dry” course teaches the vital role coral reefs play in the marine environment and how these ecosystems are currently threatened. The course describes how coral reefs function and why they are so important. Includes: 2 Dives with a PADI Instructor, PADI certification, and full equipment rental. Age 15 and up. Student must be certified as PADI Open Water Diver (or equivalent rating). Sharks are crucial to marine ecosystems, yet sharks are in a global decline. Learn about the value of sharks and what is causing the rapid loss of shark populations. Includes: 1 Classroom session + 2 Dives with a PADI Instructor, PADI certification, and full equipment rental. Age 15 and up. Student must be certified as PADI Advanced Open Water Diver (or equivalent rating). Deep diving opens the door to many new exciting dive sites like deeper wrecks, reefs and walls. Student divers will develop the technique involved in deep diving up to 40m, while avoiding disturbing delicate marine life. Includes: 4 dives with a PADI Instructor, PADI Deep Diver Manual, PADI certification, and full equipment rental. Age 10 and up. Student must be certified as PADI Open Water Diver (or equivalent rating). Underwater photography is one of the most popular diving specialties, and it has become easier and more fun than ever to capture images of your underwater adventures. Because underwater photography is also popular with snorkelers, there is an option for avid snorkelers and skin divers to complete the course. Includes: 2 dives with a PADI Instructor, PADI Digital Underwater Photography Manual, PADI certification, and full equipment rental + underwater camera and housing. Age 15 and up. Student must be certified as PADI Open Water Diver (or equivalent rating). Learn how to enjoy going with the flow as you scuba dive. Get an overview of aquatic currents – causes and effects. Practice with buoyancy control, navigation and communication during two drift dives. Includes: 2 dives with a PADI Instructor, PADI Drift Diver Manual, PADI certification, and full equipment rental. Age 10 and up. Student must be certified as PADI Open Water Diver (or equivalent rating). Don’t miss a dive due to minor issues with your scuba diving equipment. Whether it’s a missing o-ring, wetsuit tear or a broken fin strap, the Equipment Specialist course teaches you to manage basic repairs and adjustments. You’ll also learn more about how your gear works, making you more comfortable with it and better prepared to take care of your investment. 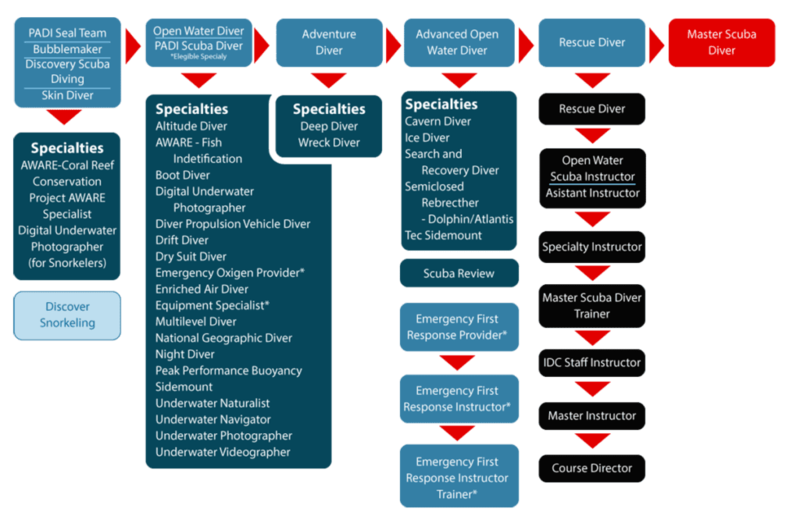 Includes: 1 Classroom session with a PADI Instructor (approximately 3 hours), PADI certification and material. Age 10 and up. Student must be certified as PADI Open Water Diver (or equivalent rating). Develop your Buoyancy skills beyond the open water diver level. Improve the quality of your dive by avoiding contact with the reef and improving your air consumption. Age 12 and up. Student must be certified as PADI Advanced Open Water Diver (or equivalent rating). The course helps the student develop the skills and knowledge required for safe search and recovery diving. Includes: 4 dives with a PADI Instructor, PADI certification, and full equipment rental. Sidemount diving gives you flexibility and streamlining options. Along with learning about the many benefits of diving with a sidemount configuration, you will learn how to trim your weight system and sidemount gear so you’re perfectly balanced in the water. Manage gas by switching second stages as planned, if wearing two cylinders and respond correctly to potential problems when sidemount diving. Includes: 3 dives + 1 pool session with a PADI Instructor, PADI certification, and full equipment rental. Age 10 and up. Student must be certified as PADI Open Water Diver (or equivalent rating). Learn to use a compass and natural navigation clues to orientate yourself underwater. Includes: 3 dives with a PADI Instructor, PADI Underwater Navigation manual, PADI certification, and full equipment rental. Age 10 and up. Student must be certified as PADI Open Water Diver (or equivalent rating). organisms, their environment and humans. Sign up for your Lembongan PADI Specialty Course today. Soon you will be continuing your adventure safely with one of our instructors at Ceningan Divers, PADI 5 Star Dive Resort.